These are not your typical football tickets! 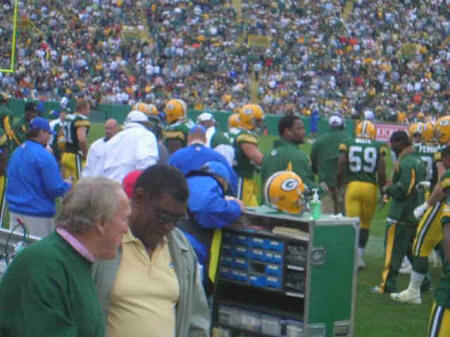 These spectacular seats in row 1 are located on the Packer side at about the 25 yard line near the south end zone (the historic ‘Ice Bowl sneak’ end zone). From this spot one can experience just how fast and hard hitting the NFL really is; see the action from the players level, hear the signals; practically feel the hits; and catch the Packer bench action. The view is unimpeded (save for the occasional TV camera passing thru) from the end zone up to about the 35 yard line, pretty good to the other 35, and harder to see at the north end zone (but the new video screens show you all the action down there). Sept 10, 2006 - ? in front of Johnny Grey Sept 10, 2006 - Sean Jones and ? Sept 10, 2006 - Johnny Grey & ?